Hiring a SEO Consultant (or company) can be one of the most critical decisions you make as an organization. Unlike an expensive newspaper or television ad that has a short shelf life, a good search engine optimization strategy can take months to impact your business in any positive manner but the results are well worth the investment in the long term. Unfortunately, the results from a poorly planned and executed SEO strategy can cripple your business if you hire the wrong consultant or company. Evaluating a SEO service provider can be a daunting task for anyone who is not familiar with the industry, as there numerous acronyms and jargon which can twist your mind in 20 different directions while getting you nowhere in the process. Some consultants will try to impress you with this, but a good consultant will hold your hand to make sure that you understand each step of the SEO process, how they work with you and how your journey together will benefit your business. A good way to make sure that you find the best SEO company for your business is to create a list of questions that you wish to know before you hire them. If it’s not possible for a face to face meeting, please insist on a Google Hangout or Skype video call so you can put a face to the name. If they decline, this is one sign that you they may not be the right provider for you or your company as you will be spending so much time working together in the coming months and years. 1. How many years of expertise do you have in SEO? This is a question you would ask any service provider, whether it’s for search engine optimization or for an accountant. You want someone with experience to assist you with your SEO strategy. Search engine optimization is a fast-pace industry with plenty of changes over the years. When selecting your SEO consultant, you want to make sure they are familiar with old and new tactics for search engine optimization. As part of their response, they should provide you with tactics that worked in the past which may no longer work in the present. This will let you that they keep up to date with the latest trends are equipped with the knowledge to make the necessary steps to update an older website which may have employed some of these tactics. 2. Do you have any experience in SEO with my industry/niche? What works really well for one industry does not mean it will work for your industry, and a good SEO consultant will let you know this upfront. If the consultant has not worked in your niche before, please ask them what process they take to learn a new niche and if you will be billed for time to do the research to get up to speed. 3. Do you have case studies or examples of sites you have worked on? This is a no-brainer, but I’m going to include as it’s something not everyone may think to ask. An experienced SEO consultant should be able to provide you with at least 2-3 samples of client work, if not more. In addition to client work, ask the consultant if they have any web properties of their own where they have had success. I personally have several websites in a variety of niches where I maintain, practice and experiment with different SEO techniques and practices. 4. Which SEO tools does your company use? Just as a carpenter needs his/her hammer and toolbox, the same goes for any reputable SEO consultant. Utilizing SEO tools not only saves the consultant time but it also saves you money, as it expedites the time it takes to analyze your website and identify any issues that need to be fixed. At an hourly rate that would be as high at $300/hr, this is one question that will be at the top of your list. If you are in discussions with a SEO company who does not use any tools, your spidey-senses should be going off the charts and you should find a polite and professional way to let them know they will not be getting your business. This is only a short list of tools, I will provide others as I’m sure someone will list a couple more in the comments section of the blog. 5. Can you guarantee me number one position on Google? Like many of the Psychology exams I did during University, this is a trick question. If the consultant answers yes to this question, my suggestion would be to pick up your phone, let the consultant know you have to pick up the kids, walk the dog, or shampoo your hair, and get out of dodge ASAP. The only exception to this question is when you are not currently ranking first for your company name; if this is the case, then there’s a glimmer of hope and you can keep your phone in your pocket. 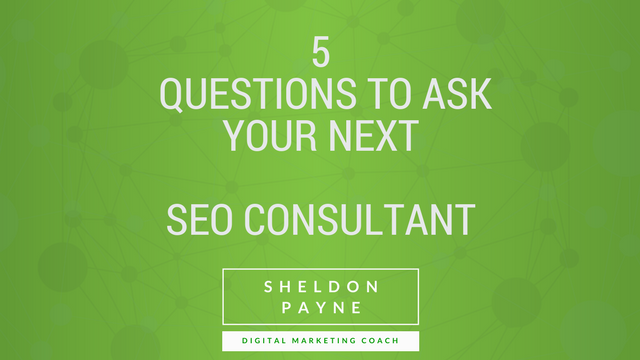 I can go on and on with questions, but I’m hoping this will at least provide you with enough ammunition to evaluate your next SEO consultant or company. Who will be working on my SEO project? If you are currently evaluating an SEO company and PaynesBrain is not on your list of potential suitors, please feel free to contact me so I can help you with your evaluation and make sure that you and your business will be in reputable hands.